In Linux, one of the most commonly used and most powerful tools is the Bash shell. 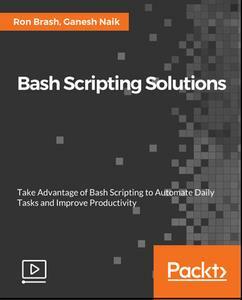 With its collection of engaging recipes, Bash solutions takes you through a series of exercises designed to teach you how to effectively use the Bash shell in order to create and execute your own scripts. The course starts by introducing you to the basics of using the Bash shell, and teaching you the fundamentals of generating any input from a command. With the help of a number of exercises, you will get to grips with automating daily tasks for sysadmins and power users. Once you have a hands-on understanding of the subject, you will move on to exploring more advanced projects that can solve real-world problems comprehensively on a Linux system. In addition to this, you will discover projects such as creating an application with a menu, beginning scripts on startup, parsing and displaying human-readable information, and executing remote commands with authentication using self-generated Secure Shell (SSH) keys. By the end of this course, you will have gained significant experience in solving real-world problems, from automating routine tasks to managing your systems and creating your own scripts.